I follow the student loan disaster closely and can’t believe Americans owe more than $1.4 trillion in student debt. Don’t get me wrong, a college education is worth a lot of money and I wouldn’t be where I am without it. Especially when some of the best education I’ve gotten has been through elearning courses online. For example, I recently took a 30+ hour video course on how to advertise on Google. It was extremely detailed and felt like a distance degree in marketing and digital marketing. And it only cost me $10! A few years ago, my mom offered to help me out with my blogs. Bless her soul but she had never really written much in her life and I didn’t know how to help her be a better writer. After scanning through my favorite distance education site and putting down $10 on a writing course, she was ready to start writing and showed me a thing or two. Elearning courses are the answer to the skills gap in America, the idea that there are jobs available but people just don’t have the skills necessary. Distance learning online can also be your ticket to financial freedom. For less than $100 on a video course, you can get the skills you need to start freelancing from home or start your work-from-home business. Online learning can be a tool for anyone, no matter your level of education or income. 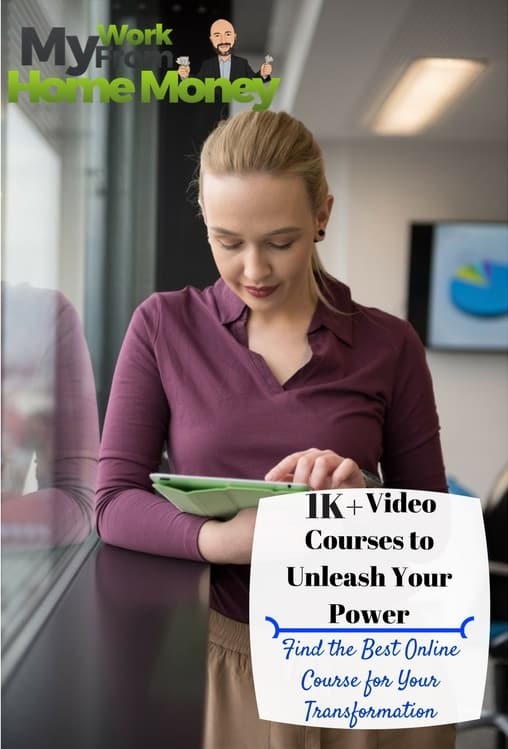 I have a master’s degree and a professional certificate but I’ve still found huge value in 12 elearning video courses I’ve taken on my favorite video course website. 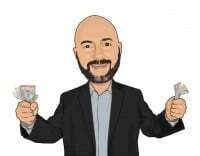 I couldn’t have grown my work from home business to an income over $10,000 a month without online learning and I wanted to share how you can use elearning courses and Udemy to benefit from the biggest shift in education. What are Udemy eLearning Courses? Udemy is an online video learning platform, think YouTube except the videos are much more detailed and organized. Unlike YouTube, Udemy has a standard of quality for its elearning courses so each video class isn’t just some joker uploading some nonsense. Video courses can be as short as an hour but I’ve seen some that were as long as 40 hours and provide an amazing level of detail. Courses are priced by the instructor but Udemy put a cap at $50 last year. Videos can be watched on your desktop, mobile or tablet. I’ll talk about how to find great elearning courses later. Once you find a course you like, you can pay with Paypal or credit card and watch the videos anytime you want. Most online classes include lifetime access, meaning you can pay for the course when there’s a discount and then watch it when you’re ready! Video courses differ but most instructors include handouts and special checklists as well as a bunch of other materials to help you learn. Each course has a Q&A page so you can ask the teacher questions and most instructors I’ve had are very fast with responses. Because Udemy uses a feedback and review system, instructors want to keep students happy and will go out of their way to help you learn as much as possible. How to Use Udemy Courses to do Anything! There are other elearning platforms, I’ve just always liked Udemy because it’s the largest and has a huge selection of courses. Whether you choose Udemy or another distance learning website, don’t miss the opportunity. Many of these video courses are years of experience, boiled down into 10 to 20 hours of training. I’ve only been disappointed a few times in the courses I’ve taken and have learned more than I expected on the majority. While you won’t get degree credits for most of the elearning courses on Udemy, some will give you a certificate when you complete the course. The certificate might not help you much in getting a job but the skills you gain will help you succeed. Udemy had more than 1,400 courses available as of 2015 and the site has grown since then. No matter what you do for a living, or what you want to do, I can almost guarantee there will be a course that will help you do it better. The best part about Udemy is that it is constantly running special discounts. Yeah, $30 or $40 isn’t a lot of money when you consider skills you learn could change your life but paying $10 for the same course is a whole lot better! That’s why I recommend creating an account on the elearning site now, whether you have time to take a class or not. Udemy will send you an email when there is a special offer on courses, usually a $10 deal for any course on the site. Since most courses offer lifetime access to the videos, you can take advantage of the $10 deals even if you don’t have time to watch the videos right now. Just pay for the course and take the class whenever you like. Instructors update their courses regularly and you can watch the videos as many times as you like. 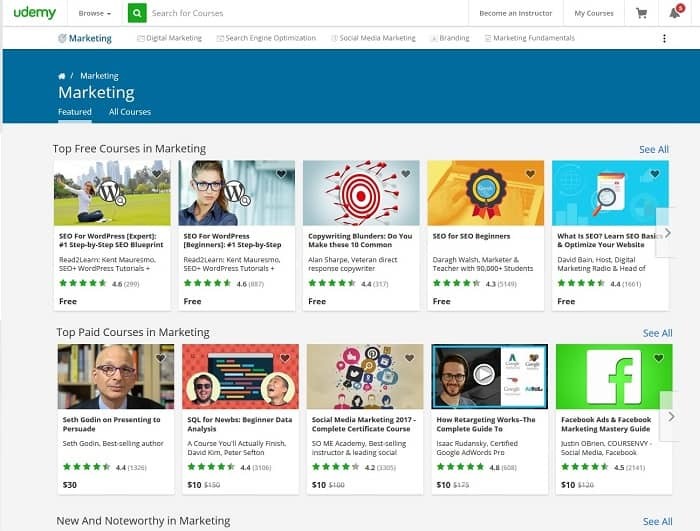 The one complaint I have about Udemy is that there are so many elearning videos available that it can take a few minutes to sort through to find the best. The website includes several ways to find the course you need. If you have an idea of the general category of distance learning, you can browse categories which will show you a drop-down menu. I usually like using the search bar to find classes better because then you can filter courses by reviews, price, level of experience and other criteria. When you start typing in the search bar, it will show a drop-down with popular suggestions so you don’t have to know exactly what course you want. 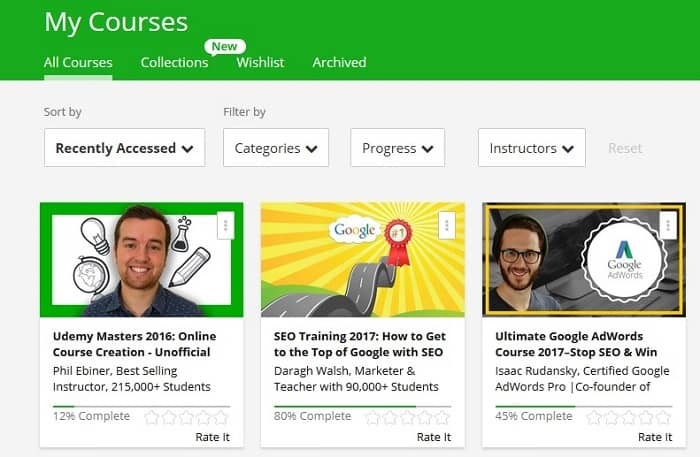 Udemy will show a list of all the courses that match your search. I usually sort by the courses with the most reviews first. Getting a lot of reviews is not only a sign of a good course but also shows that the instructor knows how to promote their course and use Udemy. That means they probably have more experience with elearning courses than other instructors and you’re more likely to get a professional quality course. After you’ve found a few online courses that look good, read through their worst reviews. Even the best elearning courses will have some bad reviews but many unsatisfied students might be a sign that you should find a different course. Watch for multiple reviews that point out the same problem with the course or the instructor. I also like looking at the number of hours of video instruction in each course. A longer course doesn’t necessarily mean better quality but there’s a good chance it will include more detail and you’ll be able to learn something. This quick search of available courses can be done in less than five minutes. Spend another five minutes to click through a couple of courses. Scan through the course sections and curriculum. Does it answer questions you have about the topic? I wanted to share my favorite elearning courses, the ones I’ve watched on Udemy and that have helped me. Understand though that my favorite courses will probably be different from yours. Most of my favorite distance learning courses revolved around running an online business but you can truly find any topic on Udemy. Phil Ebiner is one of the most popular instructors on Udemy and does a fantastic job with really professional videos. I’m taking this course to prepare a launch of my own elearning video courses for my investing blog. The course is over 28 hours long and includes 217 lectures on how to develop your course idea, filming and promoting. More than 20,000 students have taken the course and I learned so much that I’m confident I can put my own classes together. I’ve always been frustrated with advertising my websites on Google because it can be so expensive. I never realized how detailed you can get with your ads and how you can lower the cost by following a strategy. Isaac Rudansky’s video course is 18.5 hours long and includes 98 lectures. Isaac runs his own digital marketing company and the course seems like a bachelor’s degree worth of info on marketing. My mom took Cathy Presland’s writing course before writing some articles for the blogs. I watched a couple of the videos and looked over the materials and was impressed with the process. I’ve been freelance writing for nearly a decade and picked up a few tips myself. The course is only 1.5 hours but includes lots of materials and study guides. Social media marketing is a must for any business, whether sales are mostly online or not. Even if your customers come to your physical store, they are online and you need to be a part of their digital lives. The social media elearning course by iMarket XL offers enough detail that even more experienced social media users will pick up some pointers. The course is 3.5 hours long and details all the major social platforms. 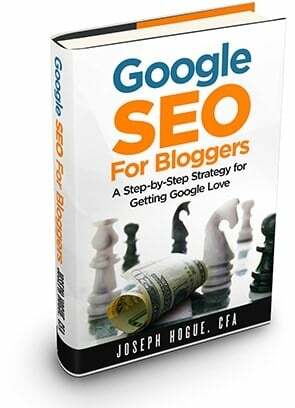 It’s organized really well and in a way that you can quickly jot down ideas to improve your social media reach. 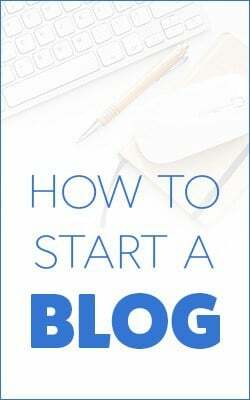 Daniel Boehm is another very successful Udemy instructor with 11 courses including this best-selling course on blogging. 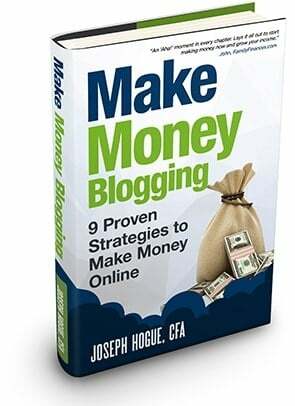 The video course is extremely detailed at over seven hours of instruction and he covers everything from building traffic to making money. Seth Godin’s freelancing video course is only three hours and hasn’t been updated since 2015 but includes some great ideas from one of the web’s most successful entrepreneurs. Seth charges over $1,000 for a seat at his live seminars…or you can get his elearning course for $50, you decide. eLearning courses are a convenient and inexpensive way to get the skills you need to find financial freedom. Not only do can you find online courses to make you a Rockstar at work but you can pick up new skills that will help launch your own side hustle success. I like using Udemy courses because they screen for quality production and the site has a huge list of available classes. Most courses will take you less than a week or two to watch and you’ll be amazed at how much you learn.